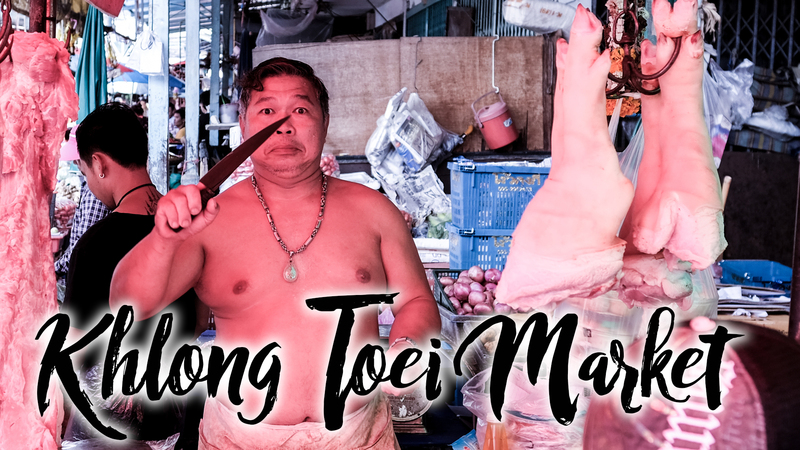 Exploring Khlong Toei Market with our kids was a blast. Seeing the “local’s market” with water bugs, live eels, and pig faces was one heck of an experience. After getting through our morning family ritual we headed out to find a tuk tuk to take us to the Khlong Toei Market. I’d never been there before, but I heard it is Bangkok’s most authentic market and is not really a tourist market. Which is great as far as we’re concerned. In typical Tuk Tuk fashion, it took a few rounds of negotiating before we found a fair price to take us there. After our fair share of inhaling car emissions, our family stepped out of the tuk tuk and into a stall filled with pig faces. Welcome to Khlong Toei! The kids had a great time exploring all the variety of food available there. The highlights were definitely the bugs, the live fish, and of course the pig faces. After a few hours of exploring, sweating, and finding some fresh fruit for later, we headed off to the Jim Thompson House for a quick 35-minute tour of his property and learn about how he revitalized the silk industry in Thailand. For a family with a few younger kids, it was the perfect amount of time and we all thoroughly enjoyed it. After the tour, we headed off to one of the top-rated pad thai restaurants in Bangkok, Baan Phadthai. It has a great setting and the food was top notch, although a bit pricey by Thailand’s standards. We’ll still probably be back.